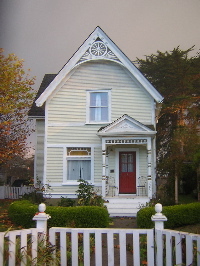 In June 2001, my husband and I moved to a gingerbread cottage in Ferndale, California from a Greek Revival storefront in Lincoln Park, Chicago. We traded birds-eye maple floors for redwood; the headaches of an 1870s brick and virgin pine timber building for a 1902 redwood "Butterfat Palace." Rose Cottage took some getting used to; it has a panoply of weird noises and creaking boards. Redwood expands and contracts a lot and the gaps in the old floor boards let air whistle through. Sometimes it's so loud you almost feel as if someone is calling; other times doors slam without warning. Deciding there were too many doors anyway, we put rocks in front of those we didn't take off. But the calling noises didn't stop and it didn't help that one of the former owners breathlessly told me, "That house is so haunted, so spooky. How can you stand it?" But she couldn't tell me who haunted it or why. Ferndale was settled in the 1850s by a mix of mainly American pioneers and Nova Scotians who hacked their way through dense underbrush to create the lush dairy fields which now surround the town. 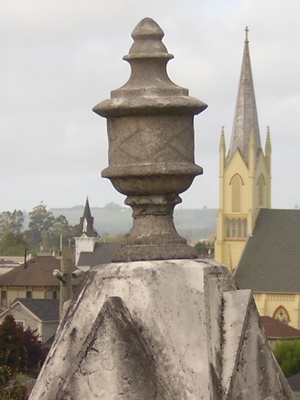 It was the largest town in Humboldt County until the early 20th Century. Fernbridge was built in 1911 to connect the southern Eel Valley with the rest of the County. 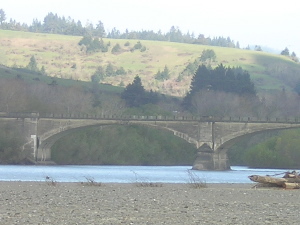 When Fernbridge was built, at nearly a quarter mile (0.6 km) over water, its massive series of arches made it one of the longest concrete arch span bridges in the world. It is said to be one of the only two remaining today; another is the Grafton Bridge in Auckland, New Zealand (about 0.98 km). Steamships came up the Salt River to Port Kenyon until 1916. Milk was shipped out by means of private railroads to the rivers as well as the risky method of cabling barrels to ships waiting off Centerville Beach. In response to these difficult shipping conditions, local dairymen invented powdered milk. The area is still a major dairy capital. 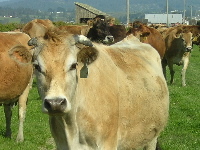 Lush grass grows easily year round in the Eel River Valley; happy cows live in the fields. We read every local history book we could find but no one was able to tell us the history of our house. One old-timer called it "Rose Cottage" and from all the roses outside and rose motif papers and old linen floor coverings inside, we could see how it could get that name. Plus it's on Rose Avenue. 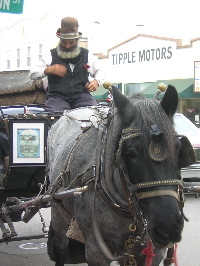 One cold afternoon, George Enos hitched up Barnaby to his vintage carriage and took us for a drive. He told us stories of the one hundred or so Victorian houses in Ferndale; who built them, who bought them and who lived in them. And then we pulled up outside of our house, and George scratched his head and said, "I've heard it was built as a wedding cottage for the children of the big house next door, but that's about all I've heard. Some say it was built for the eldest son of the house next door, others for a daughter." George said "Gee-yup" to Barnaby, and we rode on. The very next day, I went to the Ferndale Museum and asked if they knew about our house. Unfortunately, they had no file on Rose Cottage and told me to come back if I discovered anything. And there it sat until Christmas of 2002 when by chance, Ann Roberts and I were seated together at a luncheon. I mentioned the house as I always did in the hopes of finding out more than the title papers could tell us. It turned out she was an experienced historical researcher and I think the challenge fascinated her - an unknown house built for unknown people next door to one of the largest and best documented "Butterfat Palaces" in town. Almost immediately, Ann sent me a copy of the marvelous Denis Edeline notes to the Ferndale Enterprise. Denis literally wrote the books on Ferndale history and has generously given away copies of his notes and even posted some of them online. The first thing Ann highlighted was a reference to the big house. 1899 - Lee Taubman, the "popular proprietor of the Red Star Clothing House," started his house in east Ferndale on April 1st, 1899. He bought 3.5 acres from R.S. Tyrell in 1897 and occupied a building which was converted to a barn when the big house was finished, October 3. 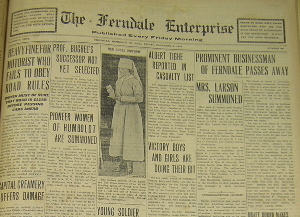 During the construction the Ferndale Enterprise wrote "May he and his family live long to enjoy it... When completed [the] new residence will be one of the finest in the Eel River Valley." How exciting! The names in the newspaper were identical to the title papers. I felt I was on the trail at last, and read on. The Taubmans had moved around a lot since they left Maquoketa, Iowa about a decade earlier. Besides Lee Taubman the family included his wife Belle Wilder Taubman, three sons and a daughter. The two older boys, Harry Lee and Charles Francis were born in Iowa, the daughter Maloa Belle in Honolulu, Hawaii, and their last son, Merton Henry Taubman, in Ferndale after they moved down from Eureka in 1894. Lee Taubman must have been pleased when both his older sons decided to marry at the same time and began construction on Rose Cottage, we imagine about as soon as they told him of their plans. 1902 -- April 18 Mr. Taubman had the lumber delivered for a new house; he bought the land from R.S. Tyrell on March 25. The new house was built by W.S. Fitzell and was described on April 22 as a story and a half cottage for Lee's son Harry. By May 16 the house was finished and "is now in the hands of the paperhangers and painters." On August 26 the Enterprise reported that a double wedding of Harry Taubman to Helene Helgestad and Charles Taubman to Verna Ring happened in the Ring home up stairs from Ring's Pharmacy on Ferndale's Main Street. The group moved to 1249 Rose for the reception. The Edeline notes had several entries of the young families moving in and out of Rose Cottage, back and forth to Fortuna, and then nothing. I'd arrived at a big blank wall. But the odd noises in the house continued and I felt that if I could only solve the mystery of what happened to my unknown Victorians the house would be happy. On May 16, 2003 I had a 101st birthday party for the house. It was a quiet affair, only our closest friends were aware what we were celebrating. I still felt that we should know more about the Taubmans. I wondered where they had gone and why no one remembered them. I started poking around in the nooks and crannies in the house, but the builder who remodeled the house in the 1980s and the workers who put the porch back on and made other changes after the 1992 earthquake had left us nothing more than a scrap of wallpaper in the front hall cupboard and two pieces of linened floorpaper in an upstairs closet. Every wall had been drywalled. I could only see the original construction of the downstairs walls by crawling around in the attic. "Solid redwood," wrote my carpenter friend on his pad. I had to agree. The walls are plated on both sides of the wall studs with 1.5 inch thick redwood planks. On top of that was plaster. Some of the plaster was knocked off and the planking drywalled; in other places, the drywall seems to have been put on directly over the old wall finish. But we still learned nothing. There were no newspapers stuffed into the cavities; no marbles in the foundation. Nothing, nothing, nothing to tell us more than names; dead and dry as dust. Where to find the people that time had forgotten? Perhaps the cemetery held a clue. The cemetery list at the Museum had nothing. "Check back," they said, "We're still working on it." So one wintry morning, I began regular walks in the cemetery, up one path and down the other back and forth, upstairs and through shrubs and trees. By March 2004 I felt as if I'd crisscrossed every walkway, seen every stone. I'd taken hundreds of photos with my new digital camera and discovered dozens of "Mothers" and "Fathers" carved deep in stone more lasting than the hearts that once remembered them. Several afternoons I was joined by my friend Lisa and her sons, Brandon and Kenneth. March 10, 2004 was not a good day for Brandon. He was dashing all around, not listening to his mother and finally ran away through the stones, a way I'd not gone before. She was hampered by the baby stroller so I ran after him. When I caught up with him, he was hopping up and down on a slab; his mother called to him, "Don't do that Brandon, he could come back to haunt you!" It took a while to begin breathing again, but when we looked, there surrounding Harry were his wife, Helene and their daughter "Baby Helene." Historical research can be frustrating because you have to know the answer to find it, but after Brandon's discovery I could barely sleep waiting for the Museum to open the next morning. The ever helpful Ann Roberts searched out the Taubmans using the information from the cemetery. She found Harry's obituary in the Ferndale Enterprise right away. With all the names and dates in one place, the rest of the tale unraveled rapidly and the most astonishing photograph popped out of the archives. Ann found Harry and Helene's formal portrait taken by Abigail E. Cardozo, at her studio in downtown Ferndale on their wedding day probably in Cardozo's Ferndale Studio before the reception. There were many happy occasions to celebrate. In 1903, Helene delivered Maloa Belle Taubman who was named after a member of the Taubman family, possibly her paternal grandmother. Courtesy Ferndale Museum The young family didn't have much time left together. 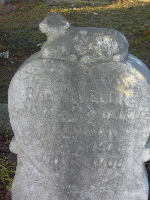 In 1905 the Ferndale Enterprise reported that Helene Hegestad-Taubman delivered Baby Helene Pauline on September 2, 1905 and died eight days later on September 10. 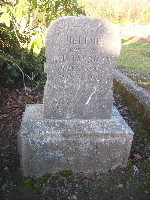 The September 15, 1905 Enterprise reported that the funeral services for Helene were held. 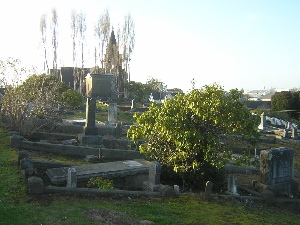 "An immense number of friends and acquaintances of the deceased attended the obsequies and attended the last sad rites at the grave in our little city of the dead. Many beautiful floral pieces literally covered the grave and in a measure attested the love and esteem in which the decedent was held by the people of this community." We can only imagine Harry holding his infant daughter and clutching Maloa's hand at the funeral of his beloved wife. Harry apparently moved out of Rose Cottage immediately because H.R. Duncan and wife occupied the house as of October 3, 1905. The next tragedy to strike the family was the death of Baby Helene on January 15, 1906 to whooping cough contracted in December. Only four months later, Ferndale was rocked by not only the great San Francisco earthquake of April 18, 1906 (7.8M), but by its aftershocks including a magnitude 6.7 earthquake, centered 100 km west of Eureka on April 23, 1906. The Taubman's Ferndale store was not badly damaged by the quake, although the building they just moved out of was twisted. In early 1907, Charles Taubman, the younger brother of Harry moved his new bride into Rose Cottage. 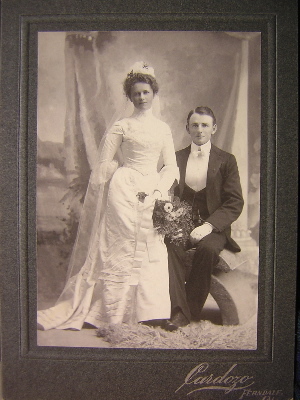 On August 11, 1907 Harry married May Belle Heney, daughter of Mr. and Mrs. W.L. Heney of Table Bluff. In 1909, they had a daughter Amy. 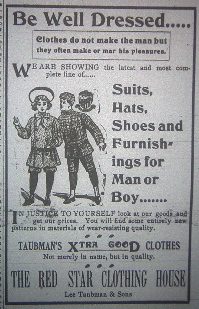 By March 9, 1909 Charles and Harry had moved both their families to Fortuna and opened a clothing and furnishing store there. In July the Charles Taubmans moved back to Rose from Fortuna and the Harry Taubman family moved to a house on Eugene Street, called the Bartlett place. Harry's family only lived on Eugene three years, by August 16, 1912 they had moved on again. Meanwhile the Island family of John Hansen and wife moved into Rose Cottage. They moved out in 1913 and the principal of Ferndale High School, Prof. A.G. Grant and his family occupied Rose Cottage until October 18, 1918. Contractor W.J. Flowers and assistants have practically completed the extensive alterations and improvements to the new home of Mr. and Mrs. Harry Taubman on upper Berding Street, recently purchased from Mrs. Benjamin. Mr. and Mrs. Taubman will have a most attractive and convenient home. And on June 3 of the same year, "Harry Taubman and family have been engaged the last few days in moving to their recently purchased home on upper Berding street. 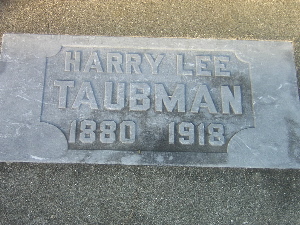 Then on December 4, 1918, Harry Taubman died leaving behind his new wife and two small daughters, one from each marriage. The death of Harry L. Taubman on Wednesday afternoon, December 4th, came as a great shock to countless friends in Ferndale and it is with the deepest regret The Enterprise reports the loss to the community of one of its finest young business men. Harry Taubman was in business with his father in the Red Star Clothing House for a number of years, afterwards taking the business into his own hands and conducting it personally until the day before his death. He was at his place of business Tuesday apparently in his usual health, but was taken violently ill that evening and although all that medical help could do was done his life could not be saved. The following week, the Enterprise reported that the Spanish Flu was spreading in many cities of California and on the funeral services for Harry. 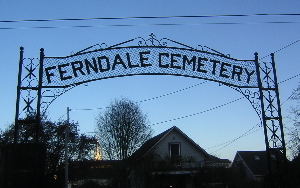 Seldom in the history of Ferndale has there been such a gathering of the people. The church was crowded and there were many who could not secure admission, who waited on the sidewalks to accompany the cortege to the Ferndale Cemetery. Such an outpouring of friends attests in a measure to the high place held by Harry Taubman in the hearts of his townspeople. Having lived the greater part of his life in Ferndale, he was well known and admired and respected by all as a young man of sterling worth, upright and honest in every relation of life. A son of whom his parents might be justly proud, a kind and loving husband and father, he leaves a memory that will be cherished always by those who loved him. To all of his loved ones whose hearts are saddened the deepest sympathy of countless friends is extended and in this expression of condolence The Enterprise wishes to unite. In 1919, Harry's father Lee passed away. Lee's wife had his remains and her household shipped back to Maquoketa, Iowa. The Red Star store and the big house on Rose were given to her daughter, May who married Fred Rushmore of Eureka on August 12, 1921. Rose Cottage was transferred from the estate of Lee Taubman to Carrie Isabell Taubman on March 24, 1920 and then to other heirs on March 19, 1930. It was occupied for about 57 years by Virginia Cave, member of Ferndale Garden Club, who fostered children from Petrolia to go to school in town. After she died, the house was stripped of historic woodwork and windows and sold a to a builder from Santa Rosa who drywalled everything in sight and sold it to a couple from Chicago. They survived the earthquake although the house almost didn't. The second floor bedroom beams cracked into the living room below and the porch fell off. They sold the repaired house to a young couple with children who five years later transferred it to us on June 1, 2001. We found the tombstones on March 10, 2004 and the rest of the historical information shortly thereafter. The Museum reproduced the wedding portrait for me and I framed it and hung it in the front hall that was built for them so long ago. The strange noises and dreams continue, but now we know our unknown Victorians, their short tragic lives in a house we share with them.